The Food Alphabet and More: Starbucks Group Happy Hour!!! Get your freebies! Starbucks Group Happy Hour!!! Get your freebies! Group Happy Hour at Starbucks! Come in groups and be rewarded! Just order at least 2 Salted Caramel Mochas and get a FREE Add-on per beverage. Order 3 and get to FREE Upsize for all the beverages you bought and when you buy as a group and get 4 or more Salted Caramel Mochas, all your purchased beverages gets a FREE double upgrade! This offer is only available on Sept 10, 2013 - That's today! - at all Starbucks branches from 2 - 5 pm only. 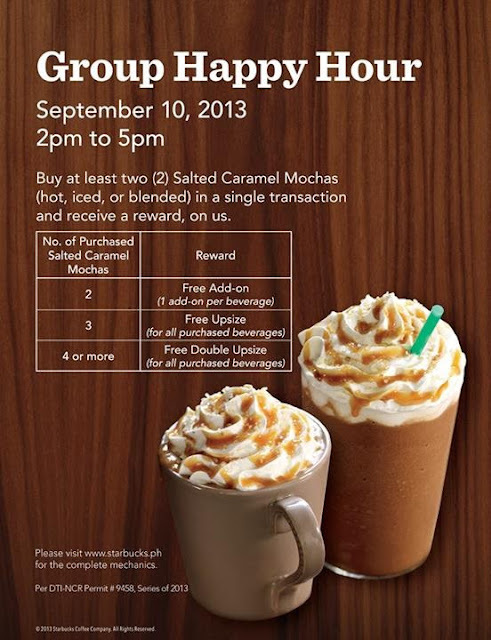 So enjoy your Group Happy Hour at Starbucks and enjoy the treat! Get to win a Starbucks Card with this link. Philippines wins Gold at Pyronale 2013!!! Rockwell's 3rd Ultimate Taste Test is here!